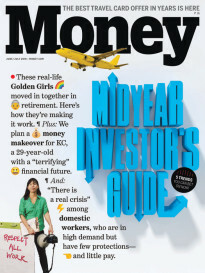 But no matter whether you’re cutting a check to Uncle Sam or expecting a big refund—or even filing for an tax extension for now—everyone can take advantage of Tax Day freebies and deals available on Tuesday, April 17. Like previous years, the 2018 Tax Day deals feature an abundance of restaurants with free food and other special discounts as a little pick-me-up on what might be a stressful day. Among the Tax Day deals are free cookies and free breakfast sandwiches, plus discounts on pizza, sandwiches, cheeseburgers, and more. California Tortilla: Say the words “chipping in” when placing any order on April 17 and you’ll get free chips and queso for Tax Day 2018. Great American Cookies: All customers at participating Great American Cookies locations get a free Cookies & Cream cookie on Tax Day, no purchase required. Hardee’s: All customers can get a free sausage biscuit from 7 a.m. to 10 a.m. on Tax Day. Just say the words “made from scratch” when ordering. Hot Dog on a Stick: On Tax Day, each customer can get a free original turkey or veggie dog, no purchase required. Kona Ice: Tax Day has been dubbed “Chill Out Day” by Kona Ice, whose trucks will be giving out free shaved ice all day on the 17th. Planet Fitness: More than 1,500 Planet Fitness locations nationwide are giving out free HydroMassages now through April 21. The offer is available for members and nonmembers alike; all you need is a coupon available via the Planet Fitness website. Bite Squad: Enter the code TAXDAY18 on April 17 with this mobile food order and delivery service, and you’ll get 7.5% off purchases of $20 or more. Boston Market: The 2018 Tax Day deal at Boston Market on Tuesday is a combo featuring a half-chicken individual meal with two sides, cornbread, and a regular fountain beverage, for $10.40. Bruegger’s Bagels: A Big Bagel Bundle, with 13 bagels and two tubs of cream cheese, is available at the special price of $10.40 on Tax Day at Bruegger’s. Chuck E. Cheese’s: From April 17 to 19, Chuck E. Cheese’s customers get a free large cheese pizza with the purchase of any large pizza. 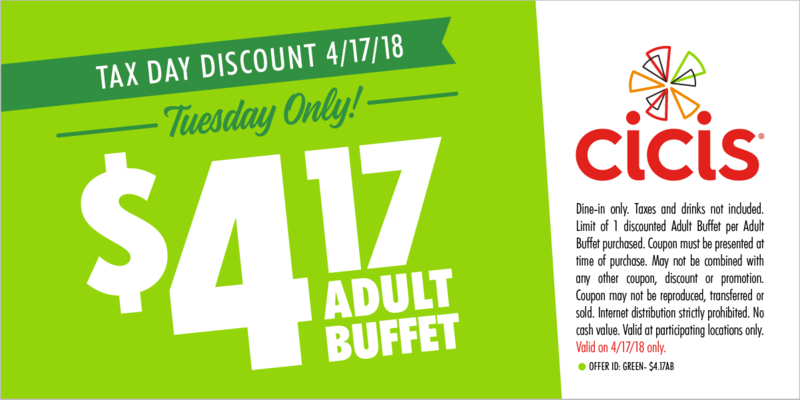 Cici’s Pizza: Use this coupon and you’ll pay only $4.17 for an adult buffet on Tax Day 2018. Farmer Boys: On Tax Day, customers at Farmer Boys—a California-based burger chain with roughly 90 locations—can get either two breakfast burritos or two “Bell Ringer Double Cheeseburgers” for $10.40. It’s a savings of roughly $2 to $3 per order. 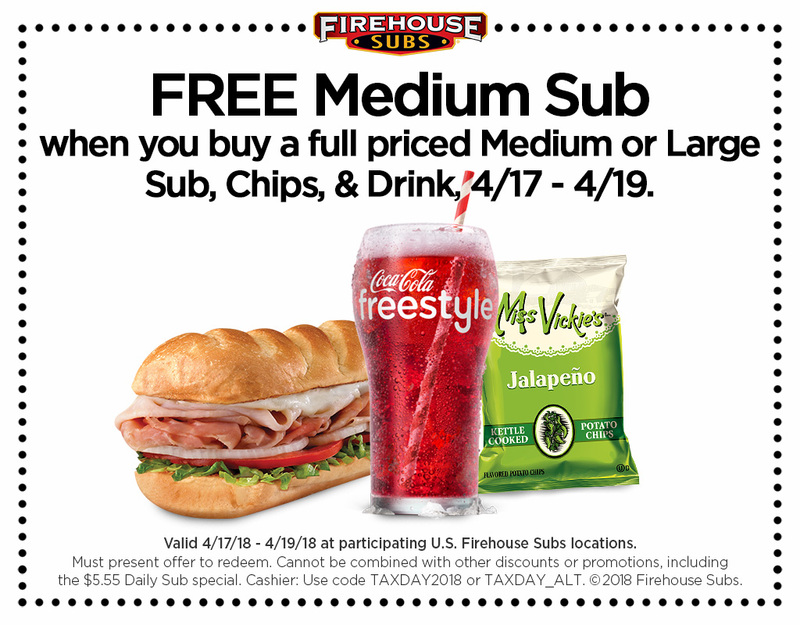 Firehouse Subs: Present this coupon for a free medium sub when you purchase a medium sub or larger, plus chips and a drink, from April 17 to 19. Grimaldi’s Pizzeria: Sixteen-inch traditional pizzas are discounted to the special price of $10.40 at Grimaldi’s locations, while supplies last on Tax Day. Hooters: Customers under the age of 12 can get a free Hooters kids meal when an adult purchases $10 or more in food on Tax Day. Hungry Howie’s: A one-topping medium pizza costs just 15 cents with the purchase of a one-topping large pizza on April 17. Enter the code TAXDAY with online orders to get the deal, which is valid for carry-out orders only. Noodles & Company: Through April 18, enter the code TAXDAY18 with online orders to get $4 off purchases of $10 or more at Noodles & Company. Potbelly Sandwich Shop: Members of the Potbelly Perks rewards program can get a free sandwich on Tax Day with the purchase of a sandwich of equal or higher price by using the chain’s mobile app. Quiznos: Place an order with the Quiznos Toasty Points loyalty app on April 17, and you’ll get 10.40% off. Schlotzsky’s: Customers can get a free small original sandwich with the purchase of chips and a medium drink on Tax Day. 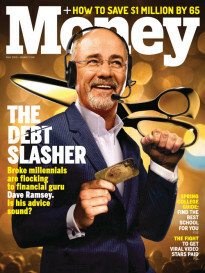 Make Tax Day less taxing. Stop by any participating Schlotzsky’s on Tuesday, April 17 for a FREE small Original with purchase of chips and a medium drink. Sonic Drive-in: Cheeseburgers are half-price all day on Tuesday for Tax Day 2018. Sonny’s BBQ: Rib dinners are 50% off on April 17, thanks to the “IRS” (Irresistible Ribs Special). Tony Roma’s: Customers get a free Kickin’ Shrimp appetizer with the purchase of an entrée on April 17. White Castle: Use this coupon to get 15% off your order on Tax Day.